Serve this classic chargrilled beef steak with roasted cherry tomatoes and mixed leaves, with the horseradish creme fraiche on the side. Preheat the oven to 200°C/gas mark 6. Preheat the barbecue or a griddle pan to a medium-high heat. Place the tomatoes on a baking tray. Scatter over the chopped garlic, drizzle with 1 teaspoon of the oil and season with salt and pepper. Roast for 15 minutes in the oven or for 5 minutes on the barbecue with the lid on, until the tomatoes have slightly softened. Set aside. Meanwhile, to make the horseradish crème fraîche, place the crème fraîche, horseradish sauce and lemon juice in a bowl and stir well. Season to taste with salt and pepper. Brush the steaks with the remaining olive oil. Just before cooking, season them generously with salt and pepper. Cook the steaks to your liking on the barbecue or griddle pan: 2 minutes on each side for rare, 4 minutes on each side for medium and 5 to 6 minutes on each side for well done. Don’t move the meat while it’s cooking – just turn it once to allow nice grill marks to form. 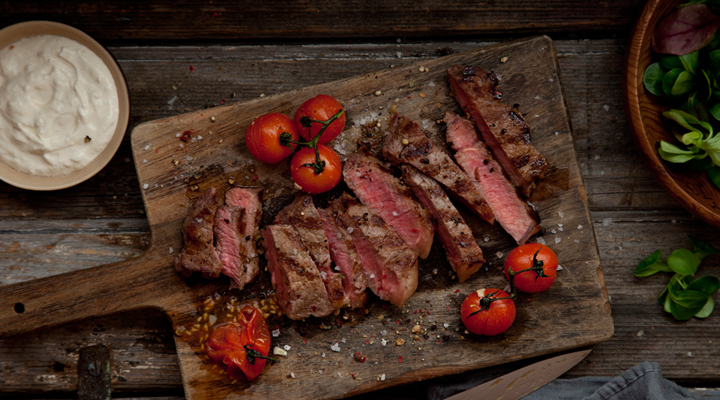 Serve the steaks with the roasted cherry tomatoes and mixed salad leaves with the horseradish crème fraîche on the side.